Whether it’s hanging curtains or a complete bathroom remodel, it’s one of life’s oldest questions. Should I save money and do it myself, or should I pay a premium and leave it to the professionals? Well maybe it’s not one of the oldest questions, but it’s certainly an often asked one. Both have their pro’s and con’s. However, when it comes to renting a bounce house, dunk tank, or something similar you may want to reconsider doing it yourself. Renting bounce houses and other inflatables and rides can be significantly less expensive than hiring a company that sets everything up, operates the equipment, and tears it down. In my experience you’re looking at an average savings of about 25%. In this economy that’s nothing at which to sneeze. However, that’s pretty much where the benefits end. There are a few variations on the inflatable rental company model. There are those that require you to pick up the inflatable, transport it, set it up, operate it, tear it down, and return it. Then there are those that will deliver, set up, tear down, and remove the inflatable leaving you to operate the ride during your event. There are some minor variations of both, but this is a pretty good cross section of the industry. Both models share one important commonality. They place some measure of responsibility and, by extension, liability on the renter. In both examples you will be responsible for the monitoring of the ride. Most party rental companies will have you sign multiple forms, one of which will be a training sheet of some sort. This sheet will not only list all of the rules that the rental company and manufacturer require to be followed, but it will indicate that you have read them, understand them, and, if signed, agreed to enforce them. I can’t express enough just how important it is that you really do closely monitor the bounce house during your event. You should forgo any alcoholic beverages, and stay immediately next to the ride during its operation. Some states, like Pennsylvania, have laws that specifically protect the amusement company due to your assumption of the inherent risks associated with the use and operation of a rented bounce house. Should someone get hurt during your event and they decide to start suing, you are going to have to prove that the participant didn’t follow the rules (rules that you contractually agreed to repeat to every rider each every time that they ride). You’ll also have to prove that you were right there next to the inflatable during its operation. All it takes is one picture on Facebook to bring a quick and messy end to your case. Some people have tried the defense that the rental company didn’t clearly explain what was expected of them and sometimes the defense works but you have to make a really good case for why you signed something without reading it. Some other considerations to contemplate: When renting a dunk tank or water slide, some states require that a certified lifeguard be present during the event. If you choose a company that has you set up the inflatable yourself, you will be responsible should it blow away and start dumping kids on the pavement. Most rental inflatables that I’ve seen are rather worn looking. Also, amusement rental companies tend to have a lot of the same type of equipment. 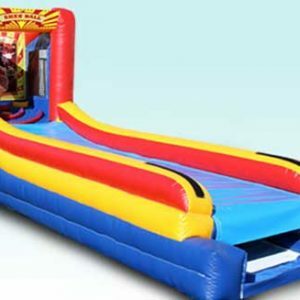 So, if you are looking for a variety of inflatables from which to choose, or something unique, chances are your local rental company will only have bounce houses, dunk tanks, and maybe some obstacle courses. Dueling Mechanical Rodeo Bulls at Hoover after prom. Canton, OH. In contrast to all of the above, should you choose a full service inflatable company you need only pay the company, sit back, and relax. Otherwise, everything is on them. Reputable companies are fully insured and (depending on the state) certified by the state. They will provide their own staff to set up and operate the rides. In many cases a full-service company will be able to offer unique rides and games as well as extra services that can take your event to the next level. The question that you need to ask is, is 25% worth peace of mind. It’s always good to emphasize the differences between an inflatable company that sticks around the entire time and those that set up and return at the end to tear down. This sure can be a fun business, but it can also be a dangerous one if the proper safety precautions aren’t in place. Great information here!